In addition to all the experimental performances, it also apparently holds great potential as a super villain lair. The job of lining up thought-provoking, cutting-edge performances is the job of EMPAC's curators. And in the last year, it appears they've been working especially hard at that job. We talked with three of the four curators about what EMPAC is all about, what it has to offer the Capital Region and why you shouldn't be afraid to pay them a visit. 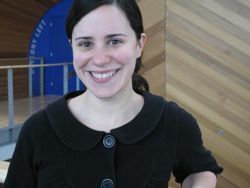 Emily started out studying visual culture at NYU and moved to the Institute of Contemporary Art in Philadelphia and the Center for Curatorial Studies at Bard, before coming to Troy. How do the curators decide what projects to bring to EMPAC? A lot comes out of conversations between the team and a period of individual reflection. Take, Uncertain Spectator, for example. That came from a private individual experience that I had and I took to the other curators. I was on vacation in Mexico and it just so happened one of my favorite curators had curated a Cildo Meireles exhibit -- a conceptual artist from the 60s to present day. I went to the exhibit and found a number of elements in it made me extremely anxious. I was walking across broken glass in a room full of talc powder with what appeared to be a candle in the room. I was very anxious but willing to go through with it to get the experience. From this we created Uncertain Spectator, which examines anxiety -- anxiety that stems from all sorts of things from homeland security and airport monitors to the financial crisis. We spent about a year and a half doing research, looking for artists, staying in conversation, seeing shows, searching through books, generating checklists. Then, once artists start confirming they can participate, the gears switch and you start thinking about how to make it happen. Raised in London, Paris and New York, HÃ©lÃ¨ne switched majors from biochemistry to sculpture midway through her education at Yale. "This is why I'm at RPI. I find research to be really creative. Science, art and music are often related for me." HÃ©lÃ¨ne is believes in the importance of live performance. "In this age of digital media, when everyone is playing video games and on Facebook -- all of these things are wonderful and new and exciting but for me live performance is something that can not be duplicated virtually." 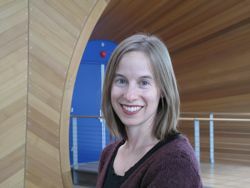 As a curator at EMPAC she works to incorporate technology and live performance. What makes EMPAC unique among performance venues? Others have parts of what we do -- there are campuses that host residencies, and universities recently went through a phase of building beautiful performing art centers, but the direction of our performances is more specific. What makes us unique is the design of the building and integration of technology. We're designed for futuristic use of media. We have four spaces, each with its own control room and they can all be operated from one control room. Everything is controlled by fiber optic. We don't know how big the media data packages will be in the future, so when we think of the work where we are pushing technology, that is unique. We can do the work where we're helping artists to grapple with this level of technology. Why should people experience the experimental performances at EMPAC? We're working with living artists that are creating the work of our time -- the artists are responding to the world as we know it. So an artist might be responding to social media. Recently a group called MTAA worked with us and used social media in the creation of the piece. They were creating a participatory experience and they had a site where they were building a barn -- a barn kit. You could go on their website and vote on different ways the kit would be put together so the plan on how to build the barn would be put together by the audience in advance of them coming to build the barn. There's definitely a fun quality to the way they designed the site and the questions, but if you dig deeper you see a comment on TV shows where the audience gets to "vote someone off." It was kind of commenting on that sort of entertainment. Like any engagement with art, what you get is open ended. It can offer you something thought-provoking, entertaining, something to make you feel part of a group. 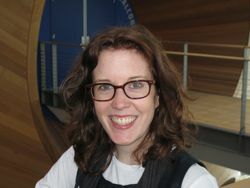 Kathleen came to EMPAC from the museum world. She spent time at the Eyebeam Center for Art and Technology, and two years in Berlin as curatorial director for Live Arts and New Media. It's always a struggle to get people to try something new. How are the curators at EMPAC working to meet that challenge? I think that we're trying to present to our audiences a program of work that is adventurous and experimental but also meaningful, that is really important -- work that incorporates technology, but where your experience as an audience member and the content of the work is more important than how it was made. We're working hard to encourage people to give it a try. Our Filament festival and Critical Mass offered a little of everything: music, dance theater. They're a way to get a taste of what we do. Also, from the visual arts side, we've done two projects with projection on the side of the building with a series of large scale projections -- they were a way to let the audience experience work on their own time without even coming inside the building. The hope is that they'll think those things are interesting enough to come in and try something else. One new thread that all the curators are working together on for 2011-2012 is one year where the work of many artists is rooted in or takes a departure point from a known text. One company recently did a piece called Gatz -- an interpretation of The Great Gatsby. This way people have a little bit of an understanding or a context to approach a work of art. It's another way to present experimental cutting edge work while making a broader audience comfortable with the work. Thanks. EMPAC is one of my favorite things in the area. 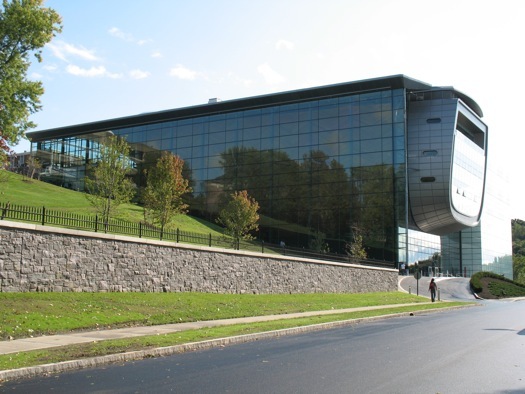 EMPAC is definitely one of the best things about the capital region, and the number of totally fascinating exhibits this year is hard to count. Can't wait to see what 2011 brings.